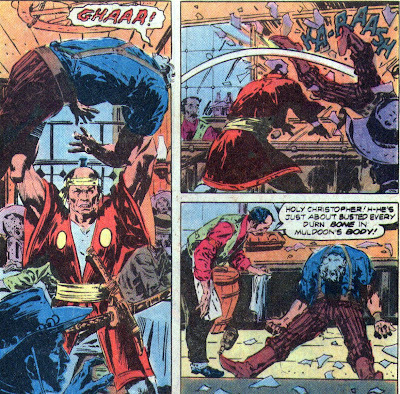 Matching Dragoons: Jonah Hex #39 "The Vow of a Samurai!" 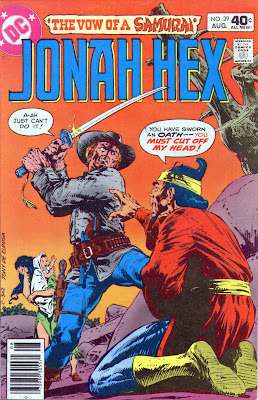 Jonah Hex #39 "The Vow of a Samurai!" "The Vow of a Samurai!" De Zuniga is back and we have a Samurai with his vow! This issue has GREAT written all over it! But let us dive right in, shall we? And, class, we all know what happens when you taunt a Samurai? Well, you do now. Of course, this gets the other patrons riled up and of course, Jonah walks in at that moment and decides to side with the lone defender. During the battle Jonah suggests that they need to exit the premises because he will be 37 in November and he is getting too old for this. Jonah decides to speed up their departure by shooting the chains supporting a hanging wagon wheel chandelier. Riding out of town the Samurai explains that he has come to America in search of bandits known as the Blair Farrow gang. The Samurai recounts how last year his daughter came to America to be a lady-in-waiting for the Japanese ambassador but while traveling cross-country to Washington D.C., her train was robbed and she was kidnapped. It has taken a full year for the Samurai to get word of this horror and raise funds to come here to find his daughter and kill her abductor. If he cannot do this, he must perform Seppuku. The Samurai, noting Jonah's bravery back at the saloon, asks Jonah if he will be come the Samurai's Kaishaku. The Samurai explains that the procedure of the Seppuku involves self disembowelment and that the Kaishaku will end his suffering by cutting off the head of the Samurai. 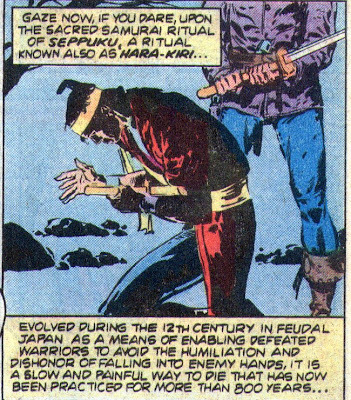 Jonah doesn't buy into this for a second and tells the Samurai that he is out of luck finding a Kaishaku. They continue riding for several hours and finally come upon a small farmhouse. They knock on the door, hoping to find food and maybe information about the Farrow gang. They open the door and find the entire family slaughtered on the floor. The Samurai lets out a scream and lunges into the darkness, drawing his sword. Suddenly Jonah catches a club to the face and drops to the floor like a level 33 Hunter in WoW (but he ain't faking). 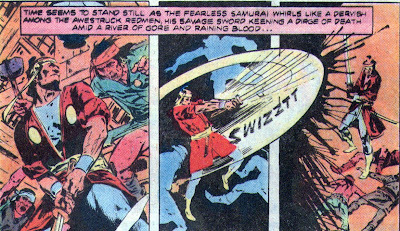 The Samurai kicks the door shut behind him and we are treated to two beautiful pages of East meets West. When they are on their way, the Samurai once again asks Jonah if he will heap even more shame upon his own head by refusing to become the Kaishaku. Jonah grudgingly agrees and they continue their search. Jonah and the Samurai get the drop on Blair and the rest of the gang around the campfire. Jonah tells them to drop their guns and Blair quickly obeys. However, the six men with him foolishly think that they can take Jonah. 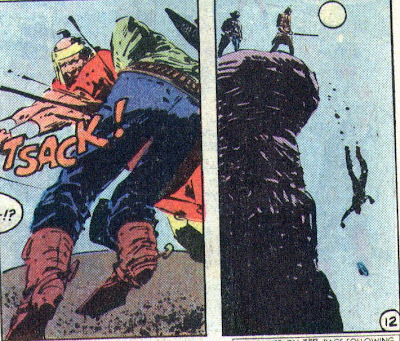 Blair falls to the ground, begging his men not to do it, but it is too late, all six of them die at the hands of Jonah Hex. As Hex finishes killing the Samurai, Blair takes his own wife and son hostage in order to escape. Using them as a shield, Blair starts to move towards his horse when Jonah draws and plants a slug right into Blair's skull. Heejong falls to the ground, mourning the loss of her husband and father. With the baby crying in the darkness, Jonah mounts up and rides off. Timeline - Jonah's mention of his upcoming birthday places this story in 1875. Why the mention of his age? I believe that Fleisher modeled parts of Jonah's life after his own. Wikipedia lists Fleisher's birthday as November 1st and Comic Book DB lists it as Oct 31 1942. This comic was published in 1980 and 1980 minus 1942 equals 38, fairly close to Jonah's age of 37. Could it be that Fleisher penned this story in 1979 or is the Comic Book DB wrong? The story covers four days. Sadly, the cover gives away part of the surprise of this story by showing Heejong with a baby but still, this tale packs one helluva punch. Jonah seems almost tame compared to the savagery of the Samurai. It's great to see Jonah honoring his word and the honor of the Samurai. Other great moments were Blair realizing that he couldn't outgun Hex; the scuminess ofBlair using his family as a shield; and the ending, with Jonah riding off leaving Heejong and the baby. Why did he do that? This woman has no-one left in the world and there is nobody around to help her. Could it be that Jonah suddenly understands the Honor code of the Samurai and realizes that by aiding the woman he would help perpetuate the shame in that family? Or is it that Jonah is completely fed up with the death that comes from a strict code of Honor compared to his more flexible, self-serving code? Tony's artwork during the Seppuku scene was incredible. Using the light from the campfire was a great touch that added a sense of eeriness to the entire book. When I think of this book, those are the images I think of. 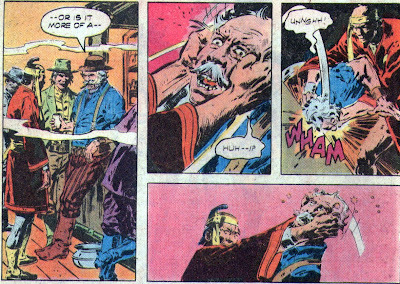 Either way, this is one of the top Jonah Hex stories and gives us a nice foreshadowing of things to come in future issues. Next Issue: DROUGHT! FLOODS! GLOBAL WARMING! AAAAAAAGGGGHHHH! ok, I'm kidding about Global Warming, but the other three are true! 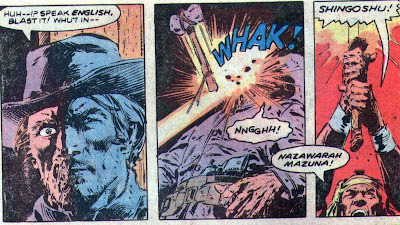 I always loved the Tony DeZuniga artwork in Jonah Hex. He had such delicate and at the same time, gritty linework. Decent story, I'll have to try and get this one. Frankly, I think that he's just fed up with the whole thing at the end. Also, is this post or pre Mei Ling? If it is afterwards, I can also understand him not wanting to get involved. This issue appears well after the first appearance of Mei Ling, but prior to her reappearance. Time wise? It happens in 1875 and I have yet to determine if it occurs before their marriage, during their marriage, during their separation or when. Anyway you slice it, it sure does appear that Jonah's feeling for Mei Ling play into this. That may be the greatest thing I've ever seen. The ending of this issue is staggeringly powerful, all the more so considering this was 1980, where few comic moments could equal what happened here. You know darn well that this finale wouldn't dare happen in a super-hero book. I think Hex was so disturbed about the Samurai's death that he wasted Blair without even collecting the reward on the guy. BTW, the story is reminscent of a third-season Magnum, P.I. episode, "The Arrow That is Not Aimed", which came nearly three years after this story. In it, Mako plays a Samurai sent to retrieve a valuable plate, and Magnum serves as Mako's Kaishaku--yes, the term is used there, too, as is Seppuku. 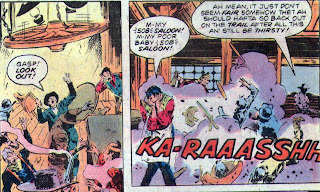 Of course, the ending isn't the same as the Jonah Hex comic, but the similarities are worth pointing out.